May | 2009 | E-verything! Twitter – what makes me follow someone? Just recently I have been thinking about how many people I follow and how I manage them. This was triggered by reaching the stage where Tweetdeck doesn’t load all my overnight tweets when I log on in the mornings so I have to look elsewhere. I have been in Twitter for about 6 months and have let my stream grow slowly (at this moment I follow 138 and am followed by 172). I like to be able to skim all tweets (from when I am offline) otherwise I risk missing interesting/useful/social “nuggets”. As my stream gets much bigger that becomes increasingly hard – particularly as a large proportion of my stream are on the other side of the world or the other side of the country (I am in Westen Australia). So I have just reached the point where there is about an hour of tweets that don’t fit in when I start Tweetdeck in the mornings – going to Web to pick them up is irritating as I then have to do about 10 “mores” to get back that far. However I have now tried using Twhirl for this and so far this is OK to catch those missing Tweets. One of the “nuggets” from my Twitter stream that made me think even more was Brad Stokes’ post ” You don’t need more Twitter followers” I found that I tweeted for very much the 6 reasons given. I have no desire to develop mammoth follower or following lists. I gain a huge amount from Twitter but already am only able to interact professionally &/or socially (rather than just check the tweets) on a regular basis with about 25% of my stream. For me Twitter is very much a “Personal” professional network and I very much enjoy the opportunities for interaction on the social as well as the professional level. In my opinion following a huge list of people would be counter-productive to getting what I want from Twitter. I try to check out new followers as soon as possible after the email tellling me they are following but this doesn’t always happen. I am ruthless about those following me – corporates, marketers and self-styled social media gurus are almost always blocked. I don’t like being used as a conduit into members of my stream. I also block minors where I can pick them out. This is a personal preference – I am an adult educator who also works with many adolescents who have dropped out of school and I just feel that it is not appropriate for me to have this age group in my professional and social network. If I am unsure about a follower they get benefit of doubt and I don’t block, but my key strategy is to follow only those that have interests in common with me although of course there are occasional exceptions. I also block and report by DM to @spam any new followers that appear to me to be spam, scams, phishing etc. An occasional issue that I have found arising with Elluminate is when one of the tools or modules doesn’t work properly. If this happens you may find that emptying the Java cache solves the problem. This is also a potential solution to any situation where Elluminate seems to be “behaving” oddly. I have found it to be a good initial troubleshooting activity when students encounter any problems as it is quick and easy to accomplish. To empty the Java cache (from a windows operating system), close Elluminate if you are currently in a session. 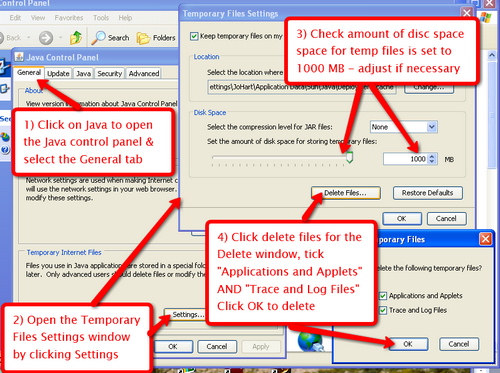 ix) Close down and then restart the computer – it may take some time to reload all the Java files when you restart and re-enter Elluminate.